Deputy Prime Minister Vuong Dinh Hue had working sessions with World Trade Organisation (WTO) leaders in Geneva, Switzerland, on September 15 to enhance WTO’s support for the country’s global economic integration. Hue, who is also head of the Inter-Sectorial Steering Committee for Economic Integration, met with WTO Director-General Roberto Azevedo, WTO Deputy Director-General Karl Brauner and Chairman of WTO General Council Xavier Carim at WTO the headquarters in Geneva. The deputy PM spoke highly of the WTO, saying the organisation plays a vital role in promoting global trade and in Vietnam’s global economic integration. He asked the WTO to provide Vietnam with technical assistance in implementing WTO agreements, getting updates on international trade and increasing public awareness of WTO-related issues. The WTO leaders welcomed the country’s contribution to stimulate the global economic trade and lauded its active role in developing agenda for the organisation’s Eleventh Ministerial Conference (MC11) in Argentina in December. 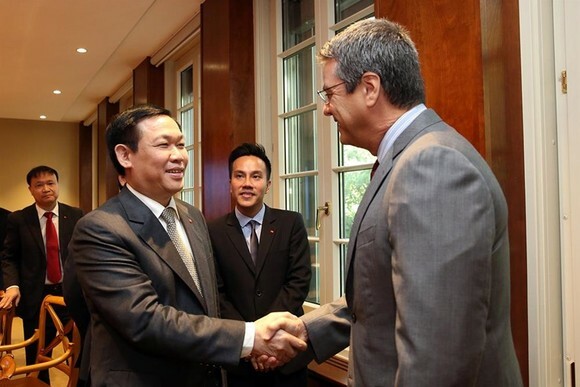 Azevedo agreed to Hue’s proposal on technical support for Vietnam and gave him updates on preparatory works for the MC11. The WTO director general also affirmed his determination to build a transparent, predictable and inclusive multilateral trading system. Vietnam’s Inter-Sectorial Steering Committee for Economic Integration and Ministry of Industry and Trade and the WTO’s Institute for Training and Technical Cooperation signed an agreement on holding a regional training course on trade negotiation skills in Hanoi slated for early November. The same day, Deputy Prime Minister Vuong Dinh Hue met with President of the Geneva Financial Centre (GFC) Yves Mirabaud and GFC Director Edouard Cuendet later the same day. Hue informed his hosts on Vietnam’s policies on security, insurance, banking and state-owned companies. The two sides discussed the future possibility of the GFC supporting Vietnam in accessing sources off funding, enhancing its capacity in managing financial institutions in compliance with international standards, and building a financial centre. The deputy PM urged the GFC to expand relations with financial associations in Vietnam and share experience in the field with them. He wrapped up the trip to Switzerland and departed for Brussels in the visit to Belgium and the European Union.